Typically Administrators will want to retain control over adding new users to the account. If required though, Administrators can give other users the ability to add new users by assigning them 'Workspace Owner' permissions. Click here if you are a Workspace Owner and want to add users to a workspace. 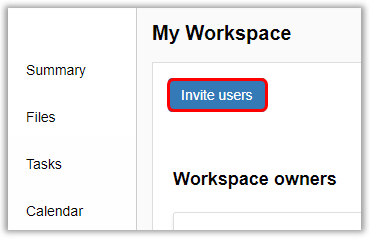 Any user can request that a new user is added to a workspace by navigating to the workspace's 'Members' section and clicking the 'Invite users' button. This request will require the approval of the Administrator/Workspace Owner. The quickest way to invite a user to join Glasscubes is by using the 'Actions' button. Navigate to Settings>User management and click the 'Add users' button. 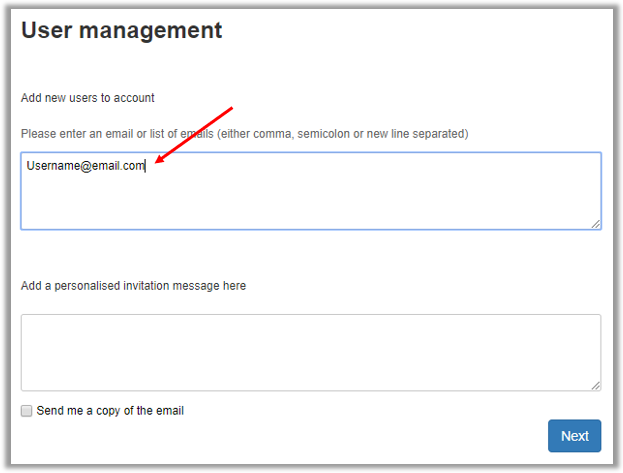 To add a user to the account, enter their email address into the text box highlighted above. You then have the option of adding a personalised message to the invitation. To send the invitation click 'Next'. You can add multiple users at the same time; providing all of the users that are being added are being assigned the same access rights and permissions. To do this, add their email addresses into the text box, separating each email address with either a comma, semicolon or by entering each on a separate line. After entering the new user(s) email address you will be given the option to select which areas of the account they are given access to and choose which permissions to assign them. Notice that the default workspace settings give “No Access”, which means that the workspace will be invisible to the user. Read Only - can only view and download content. Can Comment – the same as 'Read Only' but are able to contribute with comments. Contributor - can upload/modify content and have full access to the workspace’s functionality. Workspace Owner - can add and remove users to the workspace, change workspace settings and even delete the workspace. Can invite new users – give a user the authority to invite new users to your account. Can access connect – a contact directory with 'Customer Relationship Management' and 'Issue Resolution' functionality. Can access Private Messenger - gives a user access to the 'Private Messenger' feature that appears in the side navigation panel. Can create news articles - gives a user the option to add new articles to the news feed. Can access offline file sync - if enabled this option gives the user the option to use the Offline File Sync application. After selecting the user’s permissions click 'Add' to invite them into your account.